After having whiplash from a car accident, neck problems, back problems etc. Dr. Matt is the only doctor that has made me feel better. For over 5 yrs of seeing specialists with no relief, I was introducted the Dr. Matt. And Thank God. As a golf instructor I need my body to be in some decent shape....after just a few visits, Dr. Matt got me better than that, I Feel Great. Thanks. 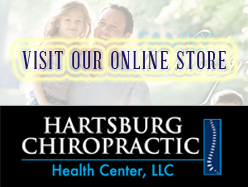 I have been a patient of Dr. Hartsburg for over a year now. His high level of content knowledge in terms of the human body and physiological responses to training is immense. Dr. Hartsburg has also worked with me on several physical issues that I have run into over the last year plus with great responses. Keep up the great work! Dr. Matt Rocks!!! He's the only dr that I have seen (and I've seen my fair share of drs) that has been able to keep me competing in my triathlons with no real injuries. I had knee surgery 2 1/2 years ago and the pain keeps coming back, but Dr. Matt is able to work his magic and keeps me running! Thank you Dr. Matt! Before seeing Dr. Matt, I would throw my back out every 6 months or so. All I would need to do is step wrong, pick up something incorrectly, or sneeze too hard, and that would be it. On top of that. my back and neck would constantly be aching. Since I starting going to Dr. Matt not only has the achiness almost totally gone away, but I have not thrown my back out at all--and there have been times when I know that I would have if I wasn't going to him regularly. I recommend him to anyone I know who has join/muscle problems and wants to feel better.